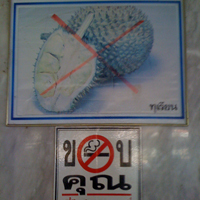 Day 27: Other places to live in Thailand, Hua Hin and Sukho Thai, two very different towns. 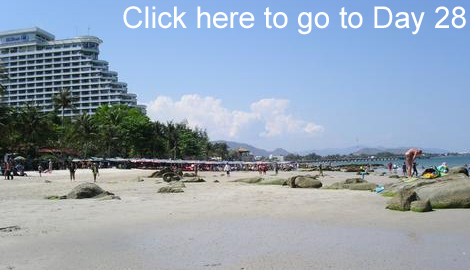 Ancient Sukho Thai and weekend town Hua Hin. Tomorrow heading North the small party town of Pai and an expats favorite Chiang Mai, along with the daily expenses. Today is the day I finally resigned to the fact that I will go over budget even if it is only a little and will still be well under the magical $500 figure. I have never cleaned the motorbike myself, as the cost is insanely cheap. It�s been about three months and needing doing badly. Not needing it whilst in town for a few hours made it an easy choice to get done today. Total for the day: 390 Baht $13.10 - Total Remaining: -115 Baht. Just below Bangkok is a small costal town called Hua Hin it is a favorite with the residents of Bangkok who want to get away for the weekend and can afford to do so. It has a large community of expats. In some ways, one could describe it as a mini Phuket everything that one could consider western is provided for. Due to it being a weekend town catering to Bangkok�s rich it is definitely a place that night owls may like. Situated on the ocean you can also enjoy a semblance of beach life, though it may be a little harder to find long stretches of beaches with out tourists. I only stayed a night and was pretty much unimpressed due to the fact it reminded me so much of the worst of Phuket. 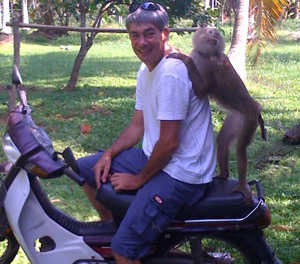 The next day I rode straight up to Sukho Thai, a 650k trip and my longest ever, one day stretch on a bike. I had read a lot about this town before leaving America and earmarked it, as somewhere to hang out for a while, I was not disappointed and found it to be one of the better towns I have stayed in. It does have a trickle of tourists coming through, which meant that I was able to easily find a wide array of restaurants serving western food and good cheap short-term accommodation was in abundance, apart from been stuck in the middle of Thailand it struck me as a good place to stay a few weeks and get to know better. The other lasting memory I have of Sukho Thai is "HOT" I wont go out if the temp drops below 60F / 15.5C so hot is not something I have ever had to worry about, been in the flatlands of Thailand it has to be one of the hottest places in Thailand for a few months each year. 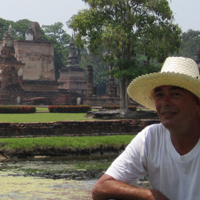 If you're looking for a truly Thai existence, take a week or two in Sukho Thai to learn more about it, two days just wasn�t enough for me to really get a good handle on the town as a place to setup in. Continue Reading Day 28: Laid back Pai and big city Chiang Mai.